The HFW-BS-05 Wireless Base Sounder unit is an aesthetically pleasing and cost effective alternative to traditional wall mounted sounder units where visual impact is important. 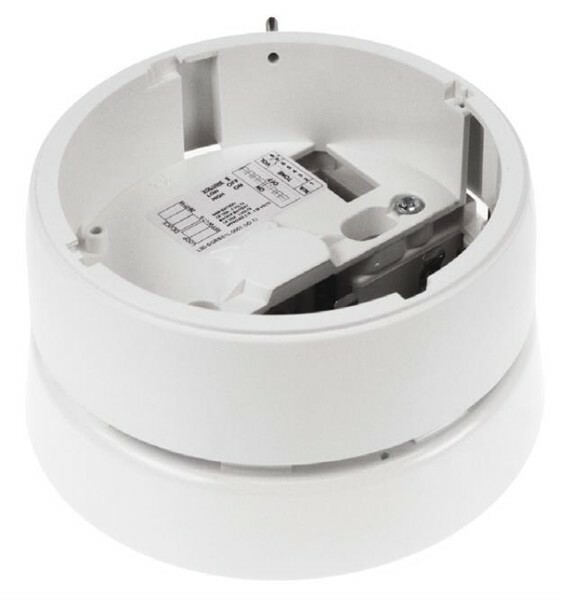 Each unit has an integral moulded base for mounting a FIREwave detector (ROP-E, RMC-E, RHT-E) or a sounder cover if a detector is not required. The unit has as standard 32 recognised sounder tones and 2 levels of volume adjustment, all of which can be easily configured on site. Powered by standard lithium batteries and utilising well proven adaptive radio signal processing algorithms ensure the highest levels of life safety and reliability. 3rd party approval to EN54-25 and EN54-03. Utilises dual low cost standard lithium batteries. Choice of 32 recognised tones. Compatible with all FIREwave Translators and expanders. Red and white cover options. 3 year expected battery life. IP Rating : 20 (Type A for indoor use only).